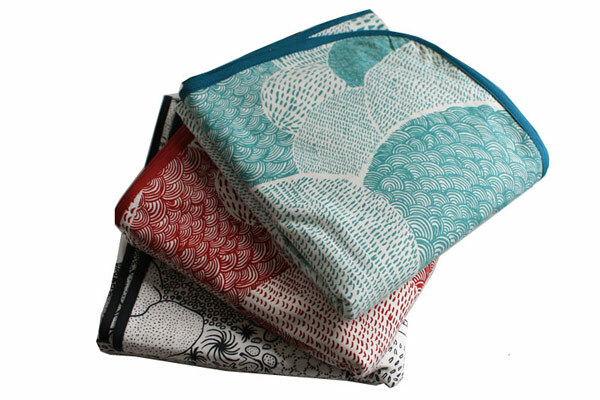 If gloomy winter weather has you dreaming of a spring day, take a look at the colorful and lively hand screen printed textiles from Australia-based Harvest Textiles. Their new children’s line features clothing and toys, and shows just how cool eco design can be. Hand screen printing their own organic cotton textile range in a little studio in Melbourne, the three creative women who launched Harvest Textiles just last year, also design a small housewares line that is equally unique. The trio behind Harvest Textiles says they try to use organic, recycled or locally produced fabrics whenever possible to reduce their impact on the environment. And in their children’s line, their handmade, artistic and intricate patterns adorn little leggings, onesies, t-shirts and organic jersey blankets. 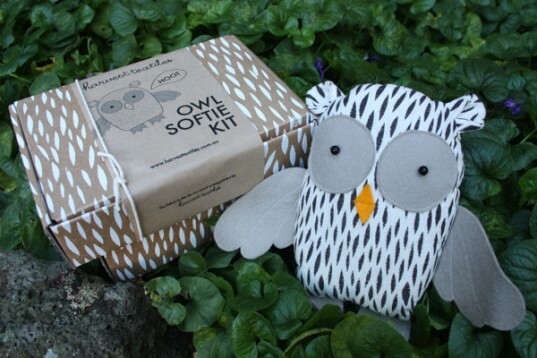 Cute softie craft kits include organic screen-printed swatches and natural fillings for you to lovingly stitch and stuff to create a range of loveable creatures. Kids can snuggle up with their bird shaped cushion or fall asleep toasty warm with the very cute sleepytime wheatbag. Summed up in just a few words: Hand crafted loveliness. If gloomy winter weather has you dreaming of a spring day, take a look at the colorful and lively hand screen printed textiles from Australia-based Harvest Textiles. Their new children's line features clothing and toys, and shows just how cool�eco design�can be. Hand screen printing their own organic cotton textile range in a little studio in Melbourne, the three creative women who�launched Harvest Textiles just last year, also design a small housewares line that is equally unique.